The directors of the Di Maggio’s Group were recognised for their outstanding contribution to Scotland’s licensed trade at this year’s SLTN Awards. Mario Gizzi and Tony Conetta, whose company has more than 20 venues across Scotland including Di Maggio’s, Amarone, Barolo Grill and Anchor Line, were presented with the SLTN Award for Industry Achievement at the 19th SLTN Awards. Gizzi and Conetta weren’t the only individuals recognised on the night. James and Louise Rusk, who launched Hutchesons in Glasgow earlier this year, took the SLTN Entrepreneur of the Year Award; Graham Guthrie of The Golf Hotel Crail in Fife, was named Licensee of the Year; the Unsung Hero award went to Billy Gold, who owns Glasgow’s Hielan Jessie pub; Nicky Craig of Edinburgh’s Basement Bar was named SLTN Barperson of the Year; and Sian Ferguson of Heads & Tales in Edinburgh took the SLTN Mixologist of the Year Award. 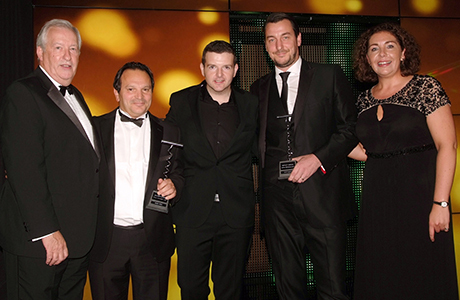 Elsewhere, Ayrshire’s Buzzworks Holdings, whose outlets include Elliots and Scotts, was named Independent Multiple Operator of the Year; Dornoch Castle Hotel in Sutherland took the award for Whisky Bar of the Year; the Crown Inn in Alva was named Community Pub of the Year; The Anderson in Fortrose picked up the Craft Beer Award; the Beer Quality Award went to The Commercial in Wishaw; Cheers Café Bar & Tavern in Fraserburgh took the Award for Best Outdoor Area and MacGochans on the Isle of Mull was named Independent Pub of the Year. 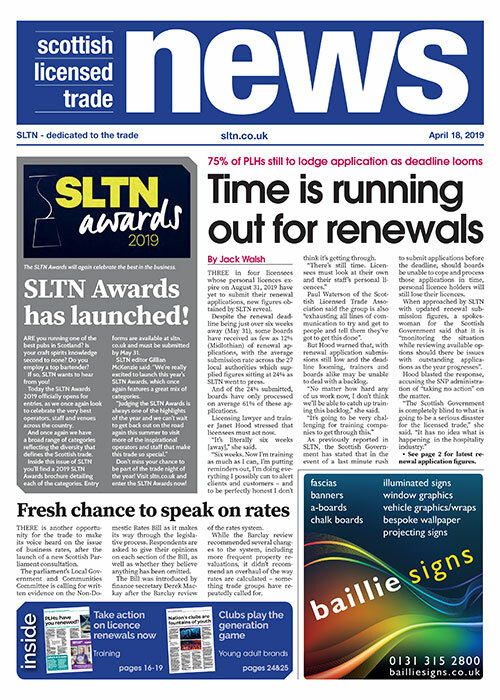 SLTN editor Gillian McKenzie said: “The standard of entries to the 2014 SLTN Awards was exceptional, highlighting the diversity and vibrancy of Scotland’s licensed trade. “The licensed trade is a vital contributor to Scotland’s economy, not to mention a cornerstone of our tourism industry. In the past year our top operators have really shown their mettle –innovating, adapting and expanding their businesses.